The first minister has called on the Welsh secretary to apologise for comments he made about Plaid Cymru. Carwyn Jones has said Alun Cairns' attempt to link Plaid with action against migrants into Welsh-speaking communities was "unwise and baseless". Mr Cairns made the comments on the BBC's Question Time programme on Thursday. A spokesman for Mr Cairns declined to comment. 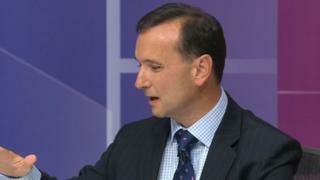 Writing on Twitter, First Minister Mr Jones said: "Baffled by Alun Cairns' silence after Question Time. Should apologise for unwise and baseless remarks. "In a week when the Tories sunk to new lows they should be careful about pointing figures at others." A Welsh Conservatives spokesman declined to comment on the remarks made by Mr Cairns but made the following statement in response to Mr Jones's broader criticism: "Is the first minister being ironic when he talks of new lows? "His party just spent several months trying to sack a leader they'd only appointed 11 months ago," he said, regarding Labour leader Jeremy Corbyn. "Almost every MP has either denounced Corbyn or resigned from his shadow cabinet, and yet he's now back with an even bigger majority. That's a low." Plaid Cymru leader Leanne Wood has accused Mr Cairns of peddling "myths and smears".